This event is for men 18 and up only. We meet the 4th Friday of every month (January - October). Food, fellowship, and a short devotional alongside the men at the Free-man House. These events are a perfect opportunity to meet other Springcreek men in a great environment. If you have any questions please contact Randall Reed at 214-926-0047 or by email at rreed009@yahoo.com. The blood collected by Carter BloodCare during each blood drive we host does not belong to them. It belongs to the community – our community – ensuring that blood products are on the shelf before lives depend on it. Your generosity reminds us why it takes a true community effort to see that babies born early have hope for life or that a child fighting blood cancer receives the platelets necessary to prevent excess bleeding. That is what the business of saving lives is about. Thank you for joining the team and accepting the challenge of saving lives while making transfusion possible. We’ll have two coaches available for you on Sunday morning to give blood so we can accept more donors with less wait time. Register now to reserve your desired time slot and avoid a wait. Walk-ups also accepted. Give blood. Give life. DivorceCare is a friendly, caring group of people who will walk alongside you through one of life’s most difficult experiences. Don’t go through separation or divorce alone. support groups are led by people who understand what you are going through and want to help. You will learn how to heal from the deep hurt of divorce and discover hope for your future. Cost: $10 for required workbook. Free childcare is available with registration. DETAILS: The Dad Tired Conference is not just for dads, but for all men! Questions? Please contact Pastor Josh. Have you experienced a major loss recently? It may be hard for you to feel optimistic about the future because of that loss. If you’ve lost a spouse, child, family member, or friend, you’ve probably found there are not many people who understand the deep hurt you feel. This can be a confusing time when you feel isolated and have many questions about things you’ve never faced before. “Going to GriefShare feels like having warm arms wrapped around you when you’re shivering.” GriefShare groups meet Sunday evenings weekly to help you face these challenges and move toward rebuilding your life. Contact Steve Maziarz for more information. Men, come and enjoy a delicious free breakfast and great conversation. This will be a great time for community with other Springcreek men. Men (18 & up) are invited to join us for a great breakfast, community, and discipleship. Reach out and invite a friend! Surviving the Holidays is a one-time class on preparing for and successfully enjoying the holiday season. It consists of a 40 minute DVD and discussion group that is a safe place to heal from the hurt of losing a loved one. On the second Tuesday of every month, Springcreek hosts a casual Leadership Luncheon for all ministry and business leaders. Lunch is served promptly at 11:22am in the Atrium. Come and share life as a community with a focus on leadership. Bring your kids, grandkids, family, friends and neighbors to experience a snippet of the excitement that happens in NextGen every weekend! 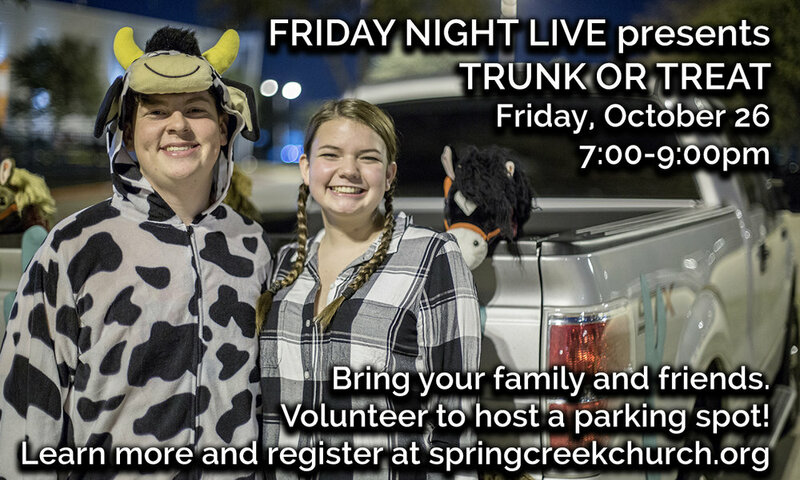 There'll be awesome worship, teaching, and a fun Trunk or Treat event in the parking lot! Doors open at 6:45pm. And, it’s all free! No registration necessary. 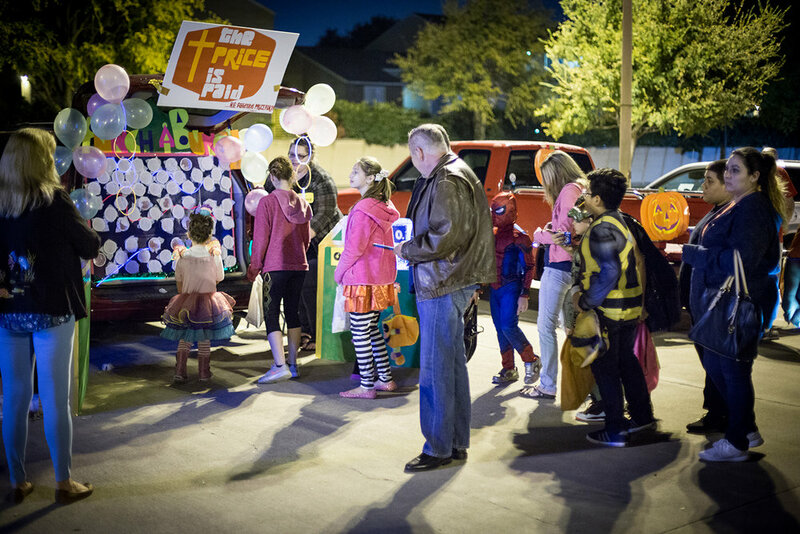 We're looking for people to host a parking spot for Trunk or Treat. Who knows? You might even win a prize for Best Trunk! Sign up! Get a parking space assignment. Buy goodies - candy or prizes. Decorate your "trunk" or just the space; nothing scary, please. Be ready to greet kids and hand out the goods around 7:45pm. We are excited to announce the second annual Bridges to Breakthroughs Banquet and Silent Auction benefitting the Free-Man House and Free Grace coming to you Sunday, October 21 at 6:30pm right here at Springcreek Church. Doors open at 6:00pm. The Free-man House is currently soliciting donations for the silent auction. Contact Troy at 214-676-2693 to arrange drop-off or Randall at 214-926-0047 to arrange local pick-up. 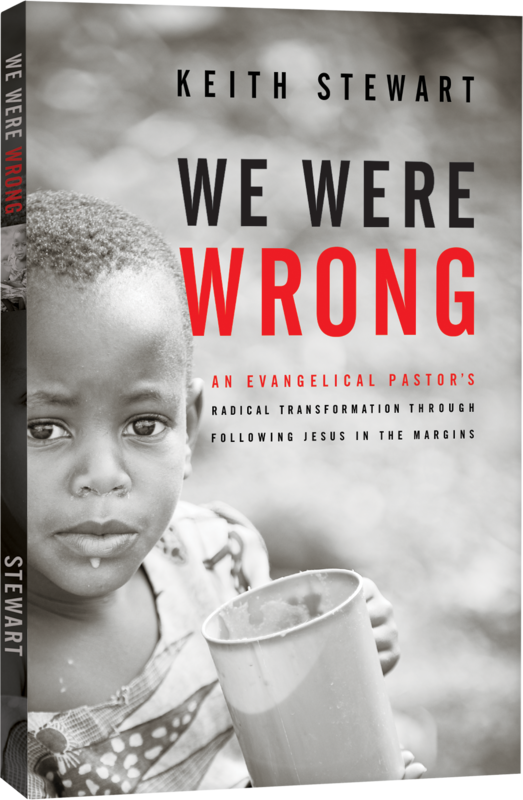 Gather with us for an evening of food and fun to raise funds for their “Sponsor a Bed Program.” Tickets are $35.00 each, on sale now at Elements Bookstore or online at www.freemanhouse.org. Communion is for those who have trusted Christ as their Lord and Savior. Join us on Saturday, October 20 from 6:15-7:00pm after service. All are welcome. Childcare not provided. Interested in being a Community Group Leader? Attend training and learn more about leading healthy community groups. Community Group Leaders will attend four hours of training (broken into two separate classes) and a monthly meeting for encouragement to discuss upcoming curriculum or events. Classes are from 7:00-8:30pm. Childcare is provided (by registration). Books are available for purchase at Elements Bookstore. How long has it been since you had a real date night with no kids? How about a night out with the girlfriends or the guys? Or just a night to go shopping without distractions? Take advantage of Parents' Night Out the first Friday of every month from 6:00 to 10:30pm. Kids up through 5th grade are welcome at the church for a night of their own fun while parents enjoy a night off. Young adults (20s and 30s) are invited to join us at Breckenridge Park for fun and fireworks! If you're currently part of our NextGen Media & Worship Team, or if you're interested in finding out more and how to get involved, join us for lunch and discussion on Sunday, April 29, from 1:00-3:00pm. We believe this ministry is built on relationships between kids, students and adults -- working side by side to reach these generations for Christ. Come find out more about how you can be part of making a difference! Would you like to be more effective as a parent? Would you like to have more fun and confidence as a parent? Logic allows children to learn from the consequences of their choices. Join us and learn how to avoid power struggles with Love, Logic and Laughter! Have fun learning new tools to raise responsible, resourceful kids and keep your sanity & sense of humor. Learn how to stop arguing, set appropriate boundaries, and raise problem solvers who can take personal responsibility. Discover your own parenting style, the most common mistake parents make, how to stay cool and avoid power struggles using fewer words and enforceable statements. This conference will give you tools that you can use for parenting kids, teens and young adults of all ages! *REGISTRATION IS NOW CLOSED BUT WALK-INS FOR THE CLASS ARE WELCOME. NOTE: LUNCH AND CHILDCARE MAY NOT BE AVAILABLE FOR WALK-INS. Join us for a free church-wide picnic at Breckinridge Park on Sunday, April 22! There'll be lots of BBQ Brisket, Pulled Pork, and all the fixins! Bring a dessert to share! This will be a great time to connect and enjoy some fun with your Springcreek family! We’ll provide some organized games for the adults & kids (volleyball, soccer, etc.) to enjoy. Plus, the park also has a bike trail and a playground so the littles can play. SIGN UP AND GET YOUR FREE TICKETS FOR FOOD AT THE INFORMATION CENTER! Note: Pray for sunshine! However, in case of inclement weather, we’ll enjoy our BBQ picnic right here at the church! Bring a blanket and hang out with your church family! Come join the Table young adults at Springcreek as we head to Pinstack in Allen! Pinstack is a unique dining and entertainment destination which features activities such as bowling, a two level laser tag arena, a rock climbing wall, bumper cars, and a high-ropes course suspended 20 feet above 100 of the newest video games and simulator technology. Feel free to invite friends too! We will leave after the Saturday night service (5:00pm) and head over to Pinstack. RSVP no later than Sunday, April 15. We hope to see you there! The Enneagram is a personality profile study of the nine basic types of people. It explains why we behave the way we do, and it points to specific directions for individual growth. In this class, you'll learn to use the Enneagram to appreciate and improve the unique relationship styles of both you and your mate. The class will be led by Carolyn Adkins, licensed Therapist and Family Therapist. Childcare available for children 5 yrs and under by reservation. Join us for the free family event! Invite some friends for this egg-stra special Easter Egg-stravaganza! Mark your calendar for this free, fun family Easter Eggstravaganza! Bring your kids, grandkids, family, friends and neighbors to experience a snippet of the excitement that happens in NextGen every weekend! There'll be awesome worship, teaching of the Easter story in an exceptional way, and, of course, our super-sized egg hunt for kids (divided by ages) in Preschool through Grade 5! Don't forget to bring your Easter basket! PLEASE NOTE: For the safety of our children, doors open 15 minutes prior to event and are locked 15 minutes after event starts. Sorry, no late admission. Questions? Please contact Jennifer Bennett. This is a free community event for document shredding. The Garland event is located offsite at Resource One Credit Union at 2475 Arapaho Road. Got a camera you thought you'd use more than you have? Consider donating it and change the life of someone eager to put it to use in Nigeria. Opportunities abound for creative people with video training in the local churches and marketplace but the equipment is greatly needed. Pastor Scott Harper will be leading a Videography vocational training session in Badagry, Nigeria in March. Video-capable DSLR or mirrorless cameras with battery, charger and accessories are needed. Please consider giving your video-capable cameras and accessories to a good cause. Bring your donations to Springcreek no later than Sunday, March 4, 2018. Questions? Contact Scott Harper for more information. The 30-Hour Famine Carnival is back! Fun, food, games, and prizes for the whole family! Enjoy bounce houses, carnival games, cake walk, and concessions! All proceeds support the NextGen Student 30-Hour Famine Fund! EVERYONE IS WELCOME! Please come and support our NextGen Students in their World Vision cause to fight hunger. Join us for three special worship services to encourage personal reflection during Lenten season preparing us for Christ’s sacrificial death, burial, and resurrection Easter morning. Ashes will be applied to those desiring them at the end of the service. Childcare available for children 5 yrs and under by reservation. Communion will be served. Childcare provided by reservation. Are you ready to watch our teams play the feud? Are you ready to meet our very own Steve O’Marvey? How about an evening full of fun and laughter? Then invite your friends and family and join us for an amazing evening for a great cause – sending our high school students on mission! On Sunday, March 11, our high school students will be traveling to Jackson, Mississippi, where they will serve with Kaleo Missions throughout the week. All the proceeds of the Feud will help offset student costs. Dinner will be catered by The Gracefull Table. You’ll enjoy their savory family recipe of Beef Lasagne or Chicken Pesto Pasta, Artisan Bread, Salad Bar and Dessert. Students raising money for the mission trip will personally serve you and take care of you during the evening. Feel free to bring a little extra cash for the “tip jars”. DEADLINE TO REGISTER FOR DINNER IS FRIDAY, FEBRUARY 9 at NOON... DON'T WAIT! Students (Grades 1-12) will have the opportunity to process their grief in a safe, nurturing environment through guided discussion and activities. Christy Stone is a professional therapist with more than 20 years of experience helping children, teens, and families find healing through life’s challenges. Christy believes in the infinite power of hope and one’s ability to better their lives. Christy is a Licensed Professional Counselor/Supervisor, Spiritual Director, and former youth pastor. She has extensive expertise in Crisis Intervention and Critical Incident Stress Management supporting groups process grief and loss. Christy lives in Plano with her husband and two boys. All blood donations benefit The Texas Scottish Rite Hospital for Children. We have registration times for both Saturday night and Sunday morning. On Sunday, we will have two Carter BloodCare Coaches available so we can accept more donors with less wait time! Give the gift of life! Please register in advance. Walk ups are also welcome on a first come first served basis. Texas Skatium Family Fun Night - Join us for an amazing night of fun and skating for the entire family! Only $10 per family. Come and visit the Shared Table Coffee Shop as we kick off our new business venture. Enjoy crafted coffee, casual conversation, and community in a whole new way! Your patronage helps support our local community partners and global missions. Open weekdays, Monday through Friday from 7:00am-3:00pm. Enjoy this Family Christmas Eve Service and join us as we celebrate the true meaning of Christmas. Note: We will have regular service times on Sunday morning, December 24 at 10:00am and 11:30am.